Nevada was once the leading state for turquoise. Virgin Valley has become world-famous for black opal. Nevada fire opal: A piece of yellow fire opal from Nevada with a sleepy translucence. This faceted round is about 9 millimeters across and weighs about 1.7 carats. Nevada is the leading gold producer in the United States. No other state is even close. In addition, Nevada is one of the leading gemstone-producing states. Nevada mines produce opal, turquoise, variscite and a wide range of other gem materials. Nevada fluorescent opal: A rough specimen of mossy opal from the Royal Peacock Mine. The image on the left is a photo of the same specimen taken under daylight conditions. The photo on the right was taken under a fluorescent lamp. 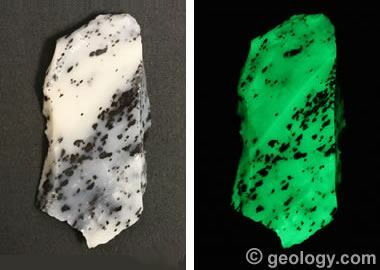 It shows the spectacular green fluorescence of some Virgin Valley opals. The gemstone that Nevada is best known for today is opal. Some of the finest black opal in the world is mined in the Virgin Valley area in the northwest corner of the state. There, millions of years ago, a volcanic eruption blanketed the land with ash and buried a nearby forest. Today parts of Virgin Valley are underlain by opal-bearing tuff and volcanic ash from that eruption which are over 100 feet thick. Some of the buried wood was petrified when groundwater carried in dissolved silica. The silica precipitated in the open spaces of the wood and replaced the woody material. Some of the silica formed beautiful precious opal. The Royal Peacock, Bonanza, and Rainbow Ridge Mines are all locations where precious opal is currently produced. All three are fee mines, open during limited times of the year for public digging. There you can pay a small fee, look for opal (and other gem materials) and keep whatever you find according to mine rules. Fire opal is also found in Virgin Valley. "Fire opal" is a term used for a colorful, translucent to transparent opal with a background color that is a fire-like hue of yellow to orange to red. A piece of yellow faceted Nevada fire opal is shown on this page. The most frequently found type of opal in Virgin Valley is common opal. Common opal does not exhibit the play-of-color seen in precious opal or the translucent to transparent hues of fire opal. In the column at right, we have a photo of some cream and black mossy opal from the Royal Peacock Mine. Although most opal will exhibit a weak fluorescence under ultraviolet light, some of the common opal from Royal Peacock has a spectacular green fluorescence. One problem that is frequently seen in Virgin Valley opal is crazing. The material looks sound when it is removed from the ground, but after a few years of exposure, cracks will develop and the opal will break into small pieces. Some cutters "age" their rough for a few years before cutting to be sure that their cutting time is well-spent. 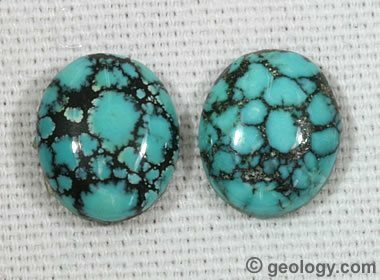 Nevada Turquoise: Two cabochons with bright greenish blue turquoise surrounded by black matrix, cut from material mined in Nevada. Nevada became a major producer of turquoise in the 1930s, and until the early 1980s, Nevada was the leading producer of turquoise in the United States. Turquoise has been produced from dozens of small mines. Some of them have produced over $1 million in rough. A few small mines continue to be worked today, mostly part-time by a few employees or partners. 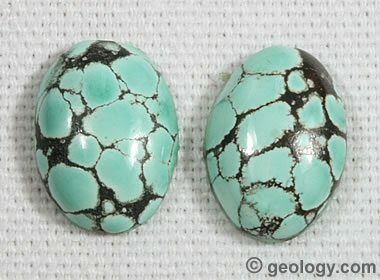 Nevada Turquoise: Two cabochons with very light greenish blue turquoise surrounded by black matrix, cut from material mined in Nevada. Nevada turquoise is found in thin veins, seams, and nodules. Some material is hard, solid rough that cuts well and accepts a great polish. Other material must be stabilized with backing or resins to produce a good cabochon. Nevada turquoise occurs in the typical range of blue, blue-green and greenish colors, with iron-rich specimens being on the green end of the color range. Specimens with and without matrix are found. Variscite and faustite are often found associated with the turquoise and are occasionally produced as gem materials. White Buffalo Stone: Some material mined in Nevada is sold under the name "White Buffalo Turquoise." That name can be incorrect. Some people report that it is really opalized calcite or howlite. We purchased some "White Buffalo Turquoise" and sent it out for x-ray diffraction, and the result was magnesite with dolomite. A better name for this material is "White Buffalo Stone." There are some reports of "white turquoise" and "white buffalo turquoise" being mined in Nevada, and a lot of material is sold under those names. Turquoise can be a very light blue or a very light green and sometimes a yellowish green. But the copper content of genuine turquoise should prevent it from being a snow-white color. We purchased some material sold as "white turquoise," sent it for x-ray diffraction, and learned that it was a combination of magnesite and dolomite. Others report that material sold as white turquoise is howlite or opalized calcite. 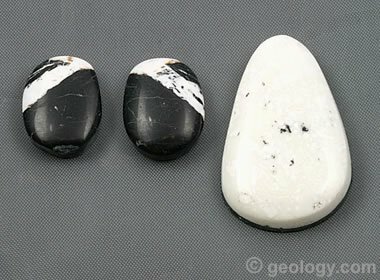 So, much of the material being sold as "white turquoise" or "white buffalo turquoise" would be better if it was called "white buffalo stone" because it is not turquoise. 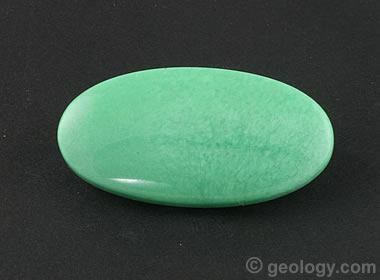 Nevada variscite: A cabochon cut from Nevada variscite with a fantastic green color and brilliant polish. This stone is 37 millimeters long and 19 millimeters wide and weighs about 26 carats. This beautiful variscite cabochon was cut by Tom Wolfe of Wolfe Lapidary. Variscite is an aluminum phosphate mineral with a chemical composition of AlPO4•2H2O. It occurs in a range of green, yellowish green, yellowish brown and slightly bluish green colors. Nevada variscite sometimes contains brown or black matrix that is very similar to the matrix of turquoise. Variscite has been produced in small amounts at a few locations in Lander County, Nevada. Some is found as nodules, and much is found as a vein and fracture-filling material. It is sometimes associated with turquoise as both minerals form above the water table, in the near-surface environment, and require a source of phosphate. Nevada variscite: Four variscite doublets cut using variscite produced in Landers County, Nevada. The large brownish yellow cabochon is approximately 29 millimeters in length. 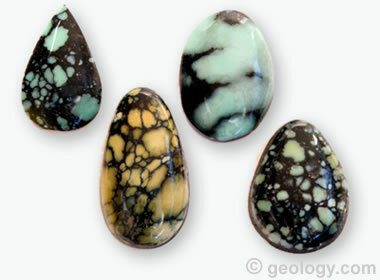 Nevada variscite is often cut and polished into beautiful cabochons. Some cutters prepare their variscite for cutting by gluing it to a thin piece of black plastic or other material. The glue and the stiff backing material provide stability to the sometimes-fragile variscite. This style of cabochon is properly described as a "doublet" - meaing that it is a composite of variscite attached to a second material. Nevada variscite has been confused with turquoise because their color ranges have a slight overlap and because of their similar appearance. The two minerals can easily be separated using the standard gemological tests described here. Rhodonite: A small amount of rhodonite has been found in Nevada. Rhodonite is a pink manganese silicate mineral that is cut into cabochons, beads, small sculptures, and other lapidary projects. This specimen from Humboldt County was photographed by Chris Ralph of Nevada-Outback-Gems.com and is used here as a public domain image. A number of other gem materials have been mined in Nevada. The state is well-known for its many small deposits of petrified wood, agate, jasper, and obsidian. Nevada is also a source of wonderstone, which is a variety of colorful rhyolite that often contains beautiful swirl and flow patterns. Beryl, faustite, nephrite, magnesite, rhodonite, topaz, and vesuvianite have all been found in Nevada.